It is high time that arrogance is identified, analyzed and evaluated. Too many arrogant leaders never realize the costs and benefits of their behavior. This book is an important window into the Machiavellian world of how power corrupts and how leaders undermine themselves unwittingly. An important contribution to the leadership literature. 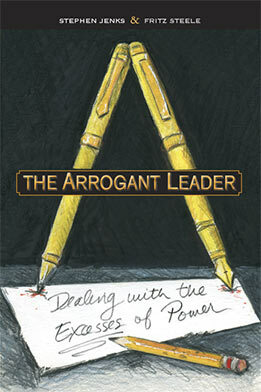 The Arrogant leader is a book everyone should read, whether they have a boss or are the boss. Jenks and Steele put arrogance in the workplace in perspective, explaining why so many business leaders can't find humility. The authors provide helpful strategies for dealing with arrogance in others and, even occasionally, in oneself. Jenks and Steele recognize individual and institutional arrogance as a set of limiting behaviors, rather than a form of personality disorder. The authors skewer the practical impacts of arrogant behavior and provide wise guidance on how to deal with them. Through this lens, we can better understand recent corporate failures. This book is of singular importance to nonprofit as well as corporate leaders. It is sad that this book had to be written, but it did. The arrogance of too many in power has destroyed jobs, income, market dominance, shareholder wealth – and in some cases, lives. Jenks and Steele vividly portray not just the blindness of the arrogant, but the causes that drive their dismissive behavior, and the possible antidotes.